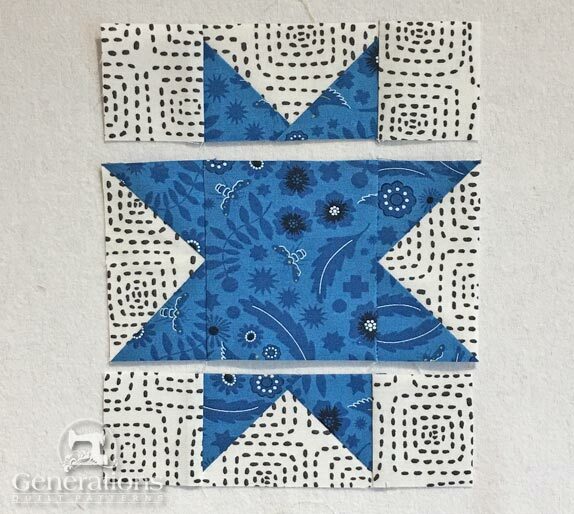 The basic patches for our Double Star block are complete. It's on to stitching up the main units. To complete the tutorial, you'll find variations on this design that are more complicated to construct. While y-seams aren't that big a deal to piece, they do take more time. 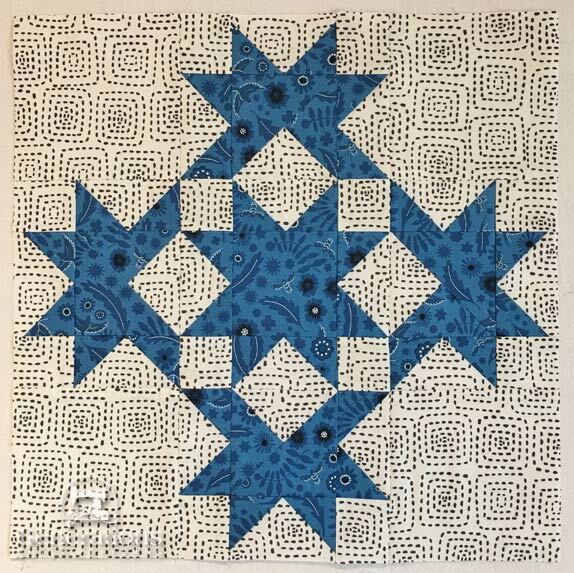 I don't know about you, but there's more quilts in my head than I'll ever have time to finish. 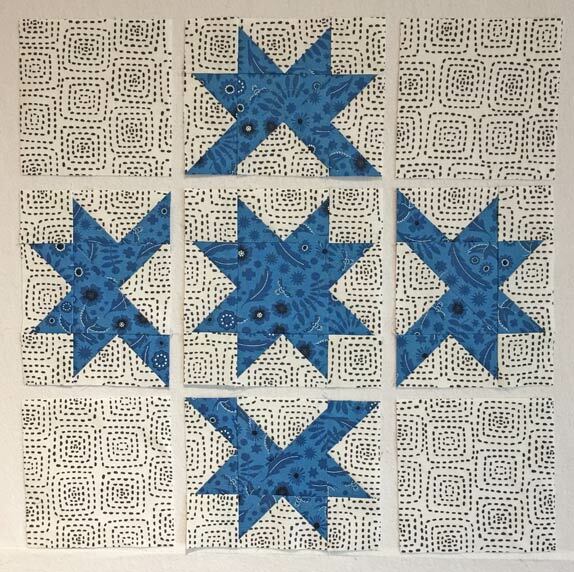 To provide a bit of inspiration ten sample layouts are shared so you can get a feel for what a quilt made with Double Stars will look like! 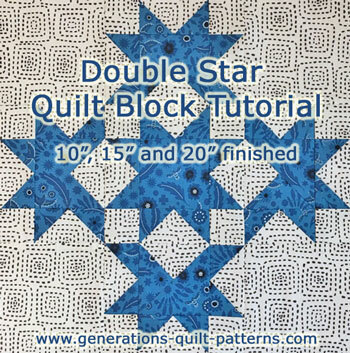 Looking for another Double Star design? It's a popular name—there's several blocks called 'Double Star'. 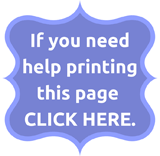 Check out this one. Arrange two long borders, two FG and #6 center square as shown below. With RST, stitch a FG to opposite sides of #6. Press with SA toward the center. With RST, stitch the rows together. Follow the pressing directions indicated by the arrows below. Use the table below to check the accuracy of your stitching. Make any needed adjustments. Set aside for Step 4. 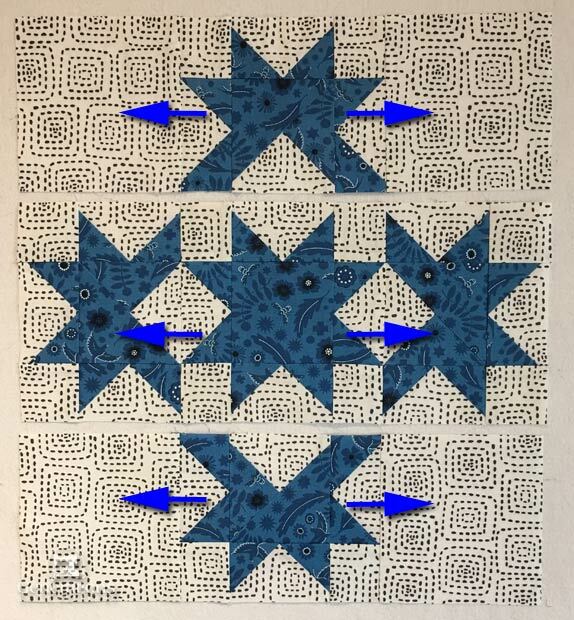 Each partial star requires a long border, two FG units and a 3P-QST. To begin, with RST sew a FG to the opposite, non-background sides of the 3P-QST. 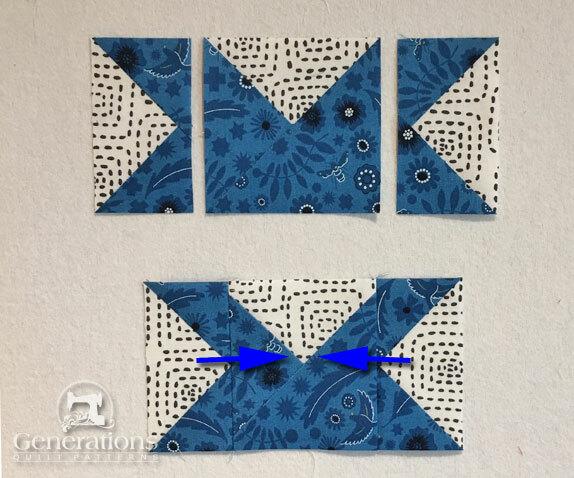 With RST and seams nesting, add a long border to the non-background side of the 3P-QST. Pin as needed. Press in the direction of the blue arrow. Check for accuracy using the table below. 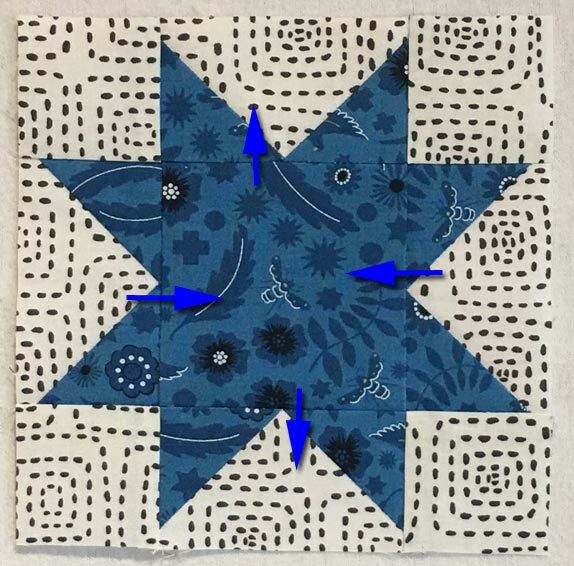 Arrange your sewn units and cut patches into the Double Star design shown below. The background side of the 3P-QST is toward the center. With RST, sew the units in each row together. One of the benefits of paperpiecing these units is if you stayed on the sewing line, there's little worry about chopping off the points of the Flying Geese with your stitching line in either the top and/or bottom rows. I encourage you to pin match the points in the middle row where the FG and 3P-QST points meet using this technique. My favorite pins for this technique are here. After stitching the patches into rows, press the SA in the direction of the arrows in the photo below. Finally, with RST, stitch the rows together using the same pin-matching technique. 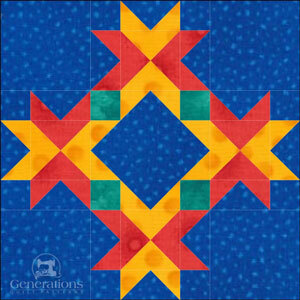 Other quilters thought so, too, because you'll find other patchwork designs similar to our Double Star. 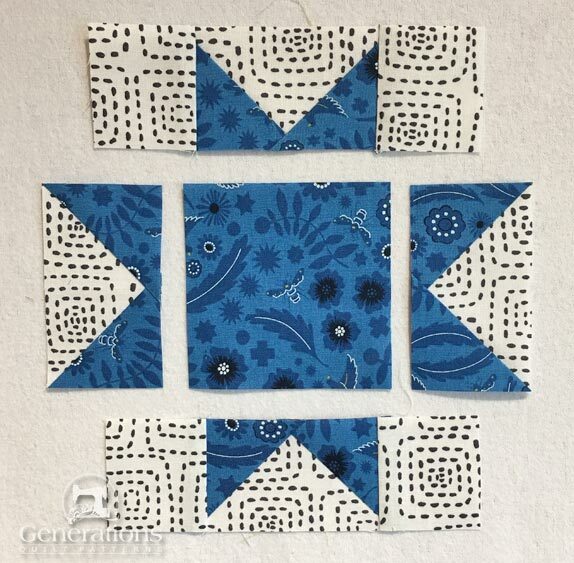 In this first variation, two-fabric quarter square triangles have been used in place of our 3P-QST. The center Sawtooth Star is gone. A nice design with lots of movement. 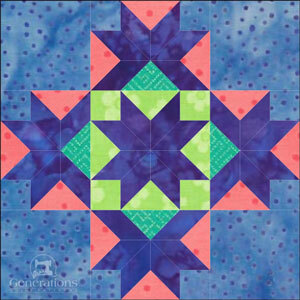 This patchwork designs ups the piecing time. Y-seams are not my favorite. Not because they're hard, but because I don't regularly do them. Lack of practice slows down the sewing. 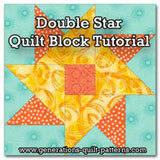 Why turning your Double Star blocks into a quilt, that's what! 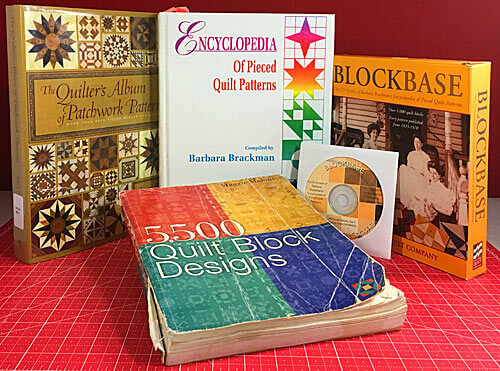 Click here to see TEN different ways to set your blocks.